This stopper contains a unique ball-shift toggle system which opens and closes the drain with a simple push of the toe or finger. One piece construction - made of top quality DELRIN or POM and ABS plastic, with a choice of Chrome Plated, Antique Brass, PVD Polished Brass and PVD Brushed Nickel. Tub Stopper with 10 "0" Rings to ensure a perfect fit in various size drains. - and it stays there! One piece construction replaces all types of stopper assemblies. Do away with troublesome trip lever parts and stoppers. Self contained unit, made of top quality delrin/POM and ABS plastic. When installed - looks better than the original stopper. Made to be left in drain, yet easily removed for cleaning. Comes with 10 "O" Rings to ensure a perfect fit. Press into drain and it stays there! Traditional chrome plated finish available in three packaging options. Give your bathroom a touch of class with our antique brass finish available in three packaging options. A modern look for your bathroom decor - our polished brass finish is available in three packaging options. Simple to install - no tools needed. Simply press into drain to form a water tight seal. You'll never have to replace linkage, stoppers, buckets or springs again! Unique toggle system - Flip left to close, flip right to open. Easy to use, with a simple push of your finger or your toe. Fits over 90% of all tub drain openings. If your bathroom tub or shower does not hold water when it is supposed to or you have just been using an ugly plastic sink stopper instead of replacing your pop up stopper the Flip-It is the perfect solution. It looks great and is easy to both install and use. 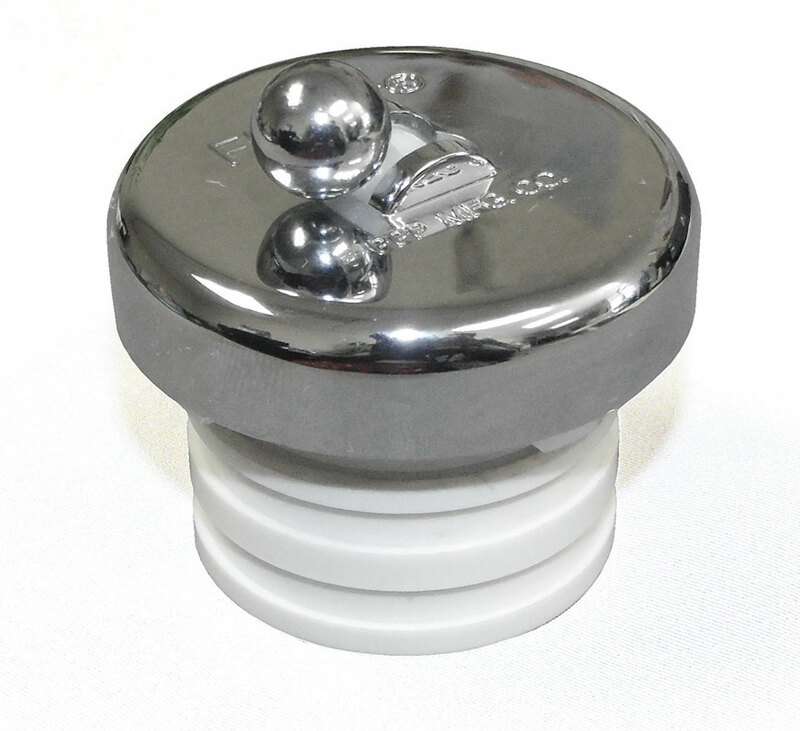 Flip-it bathtub drain stoppers will form a tight seal using our unique toggle ball system and are available in many plumbing supplies stores or online. With all the different plumbing manufacturers, replacing a pop-up stopper in a bathroom tub or shower will often require more parts than can be kept on hand by a plumber in their van or even in their office. By stocking only a few Flip-It bath room tub drain stoppers, plumbers can be prepared to simply chose the right finish and right size O-ring to fit your clients sink and move on to the more complex and more profitable plumbing repairs. Wholesalers/Suppliers: Eliminates need to stock hundreds of different CWO repair parts! Today, most manufacturers use a technology called PVD (physical vapor deposition) for their faucet finishes. PVD finishes are considered practically indestructible. PVD can be used on almost any material from brass to plastic. PVD finishes offer exceptional richness and depth, and are resistant to discoloration by sunlight. In addition, in abrasion tests conducted by independent testing laboratories, PVD finishes have been found to be more than 23 times more resistant than chrome plating. I would have gladly paid several times what this little gadget costs because it does the job perfectly. It's a steal for this price! We bought a 40 year old home and the stopper mechanism in the master bath was corroded out so there was just a gaping hole. We thought the only option was one of those big ugly leaky rubber stoppers until we came across this. We started out with the largest set of o-rings (you get 5 different sizes to find the right fit for your tub) and found those to be perfect so we literally spent all of 3 minutes installing this. It seemed to seal well, but we tested it by filling the tub at about 8 PM and leaving it overnight. The next morning...viola! A tub full of water! An the lever is so simple to use, my 3 year old has no problem with it. If you're debating this purchase and you're currently using the ugly rubber stopper...BUY THIS!! The built-in drain stopper in our tub broke, and it's the sort that one can't replace without tearing out the whole tub. So I looked around for a drain stopper I could just push into place, and stumbled across this little device. We've had this installed for about 2 weeks and it's working great! The instructions say you may need some grease to get it into place, but I found a can of Pam worked just as well for making a tight fit between the o-rings and the drain. The Flip bathtub stopper is as advertised. My husband who had great trouble installing the previous stopper did not appreciate my buying this one. He installed 2 in less than half an hour and both work perfectly, which the previous 2 did not. THIS IS AN EXCELLENT CHOICE FOR A TUB STOPPER. INSTALLATION TAKES ONLY A COUPLE OF MINUTES. Our bathtub is about 10 years old and the mounting point for the old stopper corroded off, but the room below tub has a finished plaster ceiling, so this stopper was a life saver and looks much better than just using a rubber stopper. This stopper came with a lot of different sized rubber o-ring gaskets, so there is a good tight fit. When I fitted it into the drain, I used a little Vaseline as I wanted it to be tight. I am very happy with this product and got it for a good price. I bought one from a catalog and loved it. My husband took it out to clean the drain and lost a part. The catalog I bought it from didn't carry it any longer, so I was thrilled to find it was still available. It is great when you have small children who have a tendency to put small item down the drain, and unlike traditional stoppers, this one doesn't get lost in the bath toys. Great product and company. My first had a defect, we think, so they sent me a replacement free. I'm all set now. I went to my local home improvement store on a weekend looking for a decent tub stopper for my older bathroom fixtures and there just wasn’t anything. All you can find in store are those ugly yellow/white stoppers that often don’t fit right, are easily knocked out of place, mold easily and don’t seal properly. Every time I give my kids a bath, I end up having to refill the bathtub three or four time due to the crummy replacement stoppers we used to have. Standing in the home improvement store, I asked the employee why they don’t just make something you can press into the drain with a pop-up button or something. Seemed like a pretty easy thing to me. He said he didn’t know of anything like that. So I came home to Google… and found this beauty. I just can’t say enough good things about it. It looks fantastic, stays put, installs in a snap, produces a water tight seal when closed and drains quickly when opened. It just doesn’t get any better than this. I would have paid four times as much for this and it would have been worth every penny to me! This tub stopper was very easy to install (It had multiple adjustments to fit any tub). It is the perfect replacement. Highly recommended! Very easy to use, just pick the right size O-Ring and put into your drain, that’s it. Also my puppy can’t chew this one up like a regular stopper! This is the greatest tub stopper there is. I can’t believe this product didn’t come out sooner. I was afraid it wouldn’t fit properly, but in the package they send you different size rubber O-Rings to make sure you DO find the right fit for your drain. It’s like it is custom made! I will certainly be buying more and telling all my friends about this “Flip-It Tub Stopper”. * Flip-It® and its product design are registered trademarks of PPP Manufacturing Company. All images and content on this website are the property of PPP Manufacturing and may not be used without permission from PPP Manufacturing.